The decision to create a State Bank of the Russian Empire was made by Emperor Peter III on May 1762, which was modeled on Bank of England and would have the right to issue bank notes. However, due to the coup on 28 June 1762 and the murder of the Czar, the project was not implemented. The outbreak in 1768 of the Russian-Turkish War and deficit of the state budget forced Catherine II, in turn, refer to the idea of issuing a paper money, and in December 1768 she formed the State Assignation Bank, which existed until 1818 and was replaced by the State Commercial Bank, but the first central banking body in Russia was established on 12 June [O.S. 31 May] 1860 as The State Bank (GosBank) of the Russian Empire (Russian: Государственный банк Российской Империи) which was formed on the base of the State Commercial Bank by ukaz of Emperor Alexander II. This ukaz also ratified the Statutes of the bank. According to the Statute, it was a state-owned bank, intended for short-term credit of trade and industry. The Central Bank of the Russian Federation (Bank of Russia) was established 13 July 1990 as a result of the transformation of the Russian Republican Bank of the State Bank of the USSR. It was accountable to the Supreme Soviet of the RSFSR. On 2 December 1990 the Supreme Soviet of the RSFSR passed the Law on the Central Bank of the Russian Federation (Bank of Russia), according to which the Bank of Russia has become a legal entity, the main bank of the RSFSR and was accountable to the Supreme Soviet of the RSFSR. In June 1991, the charter was adopted by the Bank of Russia. On 20 December 1991 the State Bank of the USSR was abolished and all its assets, liabilities and property in the RSFSR were transferred to the Central Bank of the Russian Federation (Bank of Russia), which was then renamed to the Central Bank of the Russian Federation (Bank of Russia). Since 1992, the Bank of Russia began to buy and sell foreign currency on the foreign exchange market created by it, establish and publish the official exchange rates of foreign currencies against the ruble. Before 1 September 2013, it was the main regulator of the Russian banking industry, responsible for banking licenses, rules of banking operations and accounting standards, serving as a lender of last resort for credit organizations. After pointed date functions and powers of CBR were significantly expanded and the central bank received the status of a mega-regulator of all financial markets of Russia. It holds the exclusive right to issue ruble banknotes and coins through the Moscow and St. Petersburg mints, the Goznak mint. The central bank issues commemorative coins made of precious and non-precious metals as well as investment ones made of precious metals, which are distributed inside and outside the country. In 2010 in honor of its 150th anniversary it issued a 5-kilo commemorative gold coin Alexander II. Under Russian law, half of the bank's profit must be channeled into the government's federal budget. The Central Bank of Russia is a member of the BIS. The Bank of Russia owns a 57.58% stake in Sberbank, the country's leading commercial bank. The Bank of Russia owns as well 100% stake in Russian National Reinsurance Company (RNRC), biggest national reinsurance company. RNRC was established for prevention possible problems with abroad reinsurance of large risks under International sanctions during the Ukrainian crisis, like constructing the Crimean Bridge. In 2017, within the framework of a joint anti-phishing project of the Bank of Russia and search engine Yandex, a special check mark (a green circle with a tick and 'Реестр ЦБ РФ' (Bank of Russia Register) text box) appeared in the search results, informing the consumer that the website is really owned by a legally registered company licensed by the Bank of Russia. The chairman was appointed by the Premier of the Soviet Union. The President of the Board of Directors of the Central Bank is the head of the central banking system of the Russian Federation. The Head is chosen by the President of Russia; and serves for four-year-terms after appointment. A Head may be appointed for several consecutive terms (Sergey Ignatyev was the Governor of the Central Bank for 11 years, and he was appointed three times, in the longest serving term in post-soviet Russia). Ost-West Handelsbank, Frankfurt am Main. All of them were members of the USSR Vneshekonombank system and were transferred to the CBR in 1992 by the Resolution of the Presidium of the Supreme Soviet of Russia. For over five years – 2000 to 2005 – all stocks of the Russian Foreign Banks were being purchased from the Bank of Russia by VTB Bank. As part of the financial support to credit institutions, the Bank of Russia invests in them through the Banking Sector Consolidation Fund and acquires (on a temporary and indirect basis) shares in the equity of such banks. The first project of this kind was Otkritie FC Bank, in summer 2017. In December 2014, amidst falling global oil prices, Western sanctions over the Ukraine crisis, capital flight, and fears of recession, the bank had increased the one-week minimum auction repo rate up by 6.5 points to 17 percent. This caused a run on the ruble, and on 29 January, the bank decreased the rate by two points to 15 percent. ^ CBR. "Bank of Russia Today:History". ^ Об учреждении Государственного банка [On the establishment of the State Bank] (in Russian). XV, 1758—1762 , № 11550 (Полное собрание законов Российской империи [ru] с 1649 года ed.). СПб. : Типография II отделения Собственной Его Императорского Величества канцелярии. 1830: 1021–1023. 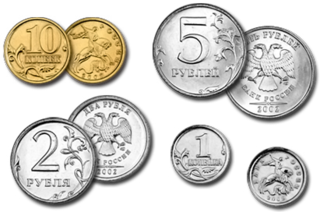 ^ "Commemorative Coins – Banknotes and Coins – Bank of Russia". cbr.ru. ^ "Russia to issue 5 kg gold coin" Archived 23 May 2010 at the Wayback Machine, The Financial Express. 19 May 2010. Accessed 19 May 2010. ^ "Bank of Russia to mark microfinance organisations on the Internet | Банк России". www.cbr.ru. Retrieved 2017-08-16. ^ "Insurers' websites receive first marks | Банк России". www.cbr.ru. Retrieved 2018-02-14. ^ "The State Bank of the USSR". Bank of Russia Today. Bank of Russia. Retrieved 26 May 2015. ^ Jason Bush, Lidia Kelly and Alexander Winning (30 January 2015). "Russian central bank makes surprise interest rate cut". Reuters. Retrieved 31 January 2015. Wikimedia Commons has media related to Central Bank of Russia. Gosbank was the central bank of the Soviet Union and the only bank whatsoever in the entire Union from the 1930s to 1987. Gosbank was one of the three Soviet economic authorities, the other two being "Gosplan" and "Gossnab". The Gosbank closely collaborated with the Ministry of Finance of the USSR to prepare the national state budget. Joint Stock Company "Goznak" is a Russian joint-stock company responsible for research and development as well as manufacturing security products including banknotes, coins, stamps, ID-cards, secure documents, state orders and medals, as well as providing secure IT services. It incorporates 7 factories and 1 R&D institute involved in different stages of the development, research, manufacturing cycle. The Moscow Interbank Currency Exchange or MICEX was one of the largest universal stock exchanges in the Russian Federation and Eastern Europe. MICEX opened in 1992 and was the leading Russian stock exchange. About 239 Russian companies were listed, with a market capitalization of US$950 billion as of December 2010. The National Bank of the Republic of Belarus is the central bank of Belarus, located in the capital city, Minsk. The bank was created in 1922 under the name of "Belarusian Republican Bank" by the Soviet of People's Commissars of Byelorussia, but soon worked under the direction of the State Bank of the USSR. Undergoing reorganizations in 1959 and 1987, the bank appeared in its current form in 1990 after the passage of banking rules upon declaring independence from the Soviet Union. The Ministry of Finance of the Union of Soviet Socialist Republics (USSR), formed on 15 March 1946, was one of the most important government offices in the Soviet Union. Until 1946 it was known as the People's Commissariat for Finance. Narkomfin, at the all-Union level, was established on 6 July 1923 after the signing of the Treaty on the Creation of the USSR, and was based upon the People's Commissariat for Finance of the Russian Soviet Federative Socialist Republic (RSFSR) formed in 1917. The Ministry was led by the Minister of Finance, prior to 1946 a Commissar, who was nominated by the Chairman of the Council of Ministers and then confirmed by the Presidium of the Supreme Soviet. The minister was a member of the Council of Ministers. 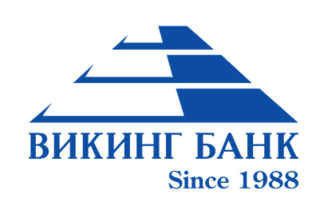 PJSC "Bank Otkritie Financial Corporation" or Otkritie FC Bank is one of Russia's largest full-service commercial banks. It has more than 440 offices of different formats in Russia. It was co-founded by Igor Finogenov, now CEO of the Eurasian Development Bank. Ministry of Finance of the Russian Federation is a federal ministry, responsible for general financial policy and for general management in the field of finance of the Russian Federation. 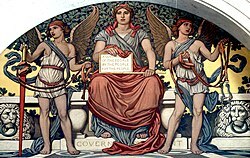 The ministry has two predecessors, the most notable one being the Ministry of Finance who is itself the successor of the Ministry of Finance of the Russian Empire. The agency has its headquarters in Ilinka Street 9. in Moscow. Ministry of Finance of the Russian Soviet Federative Socialist Republic, known prior to 1946 as the People's Commissariat for Finance, or shorten to Narkomfin was part of the government of the Russian Soviet Federative Socialist Republic from 1918 to the collapse of the USSR in 1991. It was subordinate to the Ministry of Finance of the USSR. Viking Bank is a Russian regional bank with headquarters in Saint-Petersburg. Corporate Name - Commercial Bank "Viking" Closed Joint Stock Company. Viking Bank is a part of Russian Banking System; the Bank's work is governed by the applicable law of the Russian Federation, regulatory acts of the Central Bank of the Russian Federation, and the Charter. General Banking License No. 2 is issued by the State Bank of USSR on August 26, 1988. The Bank functions on the financial market as a universal credit institution, it offers banking services of all types to companies of various business legal structures and different branches of industry, and to people at large. Russian National Reinsurance Company (RNRC) is the largest Russian reinsurance company. RNRC is No 1 in terms of the authorized share capital and No 2 in terms of paid-in capital on the domestic insurance market.